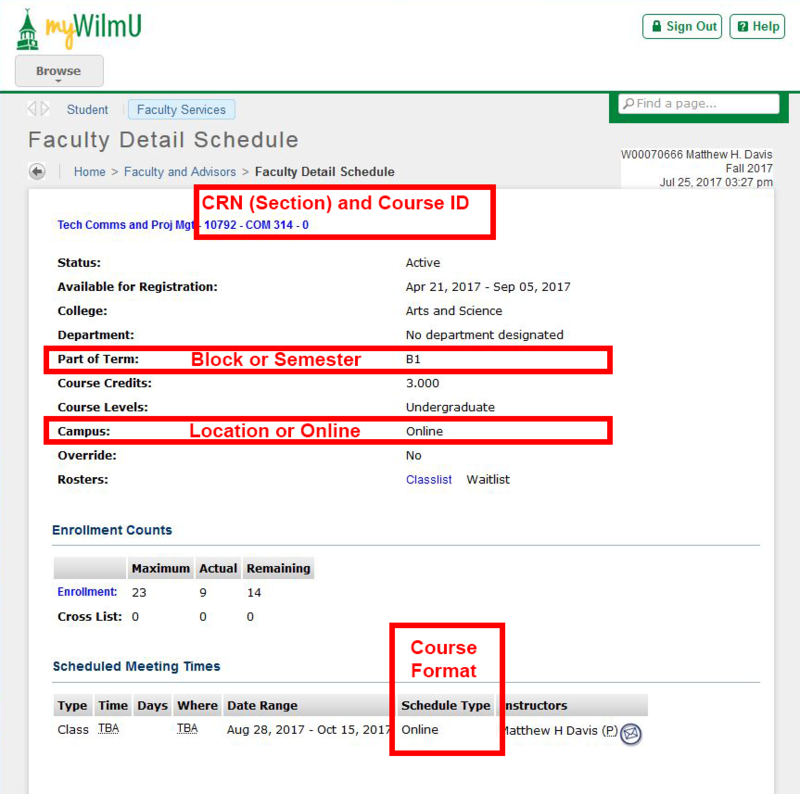 The My Classes module on the myWilmU Faculty Home page gives you 1-click access to the most common tools you need for each of the classes you're assigned to teach. Click the name of the course to open the course details (Faculty Detail Schedule) in self-service. This includes the CRN, meeting days and times, campus/location, and course format. See Course Details below for more info. Click the Group icon to view your course roster (Summary Class List) in self-service. See Summary Class List below for more info. If your course has a wait-list enabled, click the smaller group icon to view your wait list. 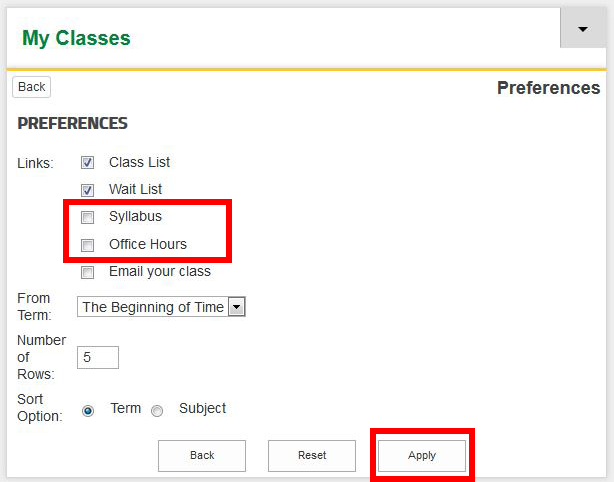 The Calendar and Clock icons are links to Syllabus and Office Hours, respectively. Neither are in use at this time , and will produce an error. You may hide these icons by clicking Preferences . The Mail icon opens a new email message in the default email software installed on your computer or device with all of your student's email addresses pre-filled. This only works if you have email software installed on your computer or device (such as Outlook or Apple Mail). This may not work with webmail (such as Outlook Web Access or GMAIL). You may also hide this using Preferences . You have a few personal options for what displays in the My Classes module. Choose your options, then click Apply. Below is a screen shot and description of the Course Details, called the Faculty Detail Schedule in Faculty Self-Service . The CRN and Course ID are located at the top of the page, next to the course name. You can see the semester or block the course is offered in Part of Term. You can view the location where the course meetings in Campus. You can view the format of the course in Schedule Type. 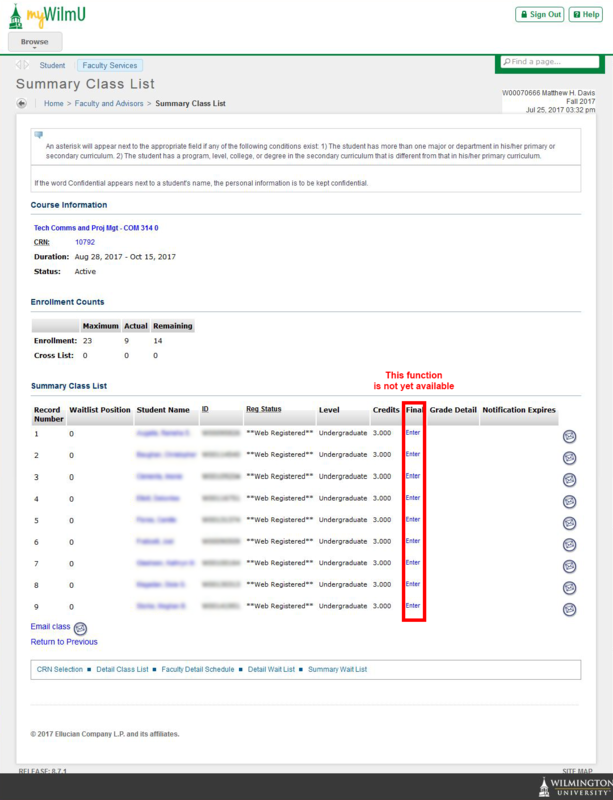 Below is a screen shot and description of the Course Roster, called the Summary Class List in Faculty Self-Service . You can view number of students in your class, and each students' name. You can email the whole class, or just one student, by using the mail icons. The Final column is not currently in use for grade entry. Instead, you use Enter Final Grades in Faculty Self-Service.